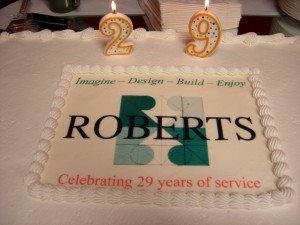 Celebrating Roberts’ 29th Anniversary - Roberts Architects LTD Roberts Construction Group, Inc. Celebrating 29 years of serving the North Shore. Our anniversary cake from Bennisons Bakery. 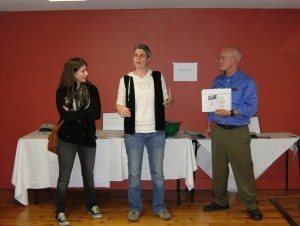 Winners of the coveted "2 Men and Truck" prize, Kelly and Abby describe how the prize helps towards the goal of expanding the building and the mission of Felines inc, a no kill cat and dog shelt. 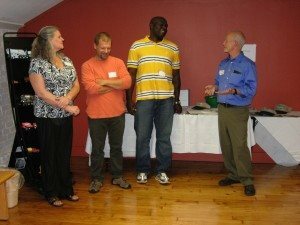 Christy, Pete, Irving and Dave addressing the guests at our open house anniversary celebration.